Accessible and universal design is a principle that makes architecture usable for people with varying needs, such as more space or lower placement of light switches for people who use a wheelchair. 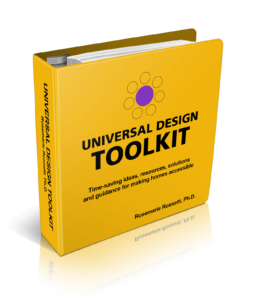 After the debilitating accident that caused her hospitalization and paralysis years ago, Rosemarie had to quickly learn about accessible and universal design. She describes her previous home. "Every step of the way, there was a barrier. From the moment of driving into the garage and trying to figure out how I was going to get into the house [...] Every step, every position along the way was a total nightmare," Rosemarie remembers. There were no ramps into the home. Doorways and hallways were too narrow to traverse from a wheelchair. Then came the decision of what should come next. Should Mark Leder, her husband, and Rosemarie renovate their home? Would they have the space to add on? Could they work with a builder and modify a model home? Or could they design a home from scratch? Over the course of its existence, the home has seen over 2,400 visitors and the couple is constantly busy hosting new groups, speaking at events or learning and teaching about new products and design principles. "It's been much bigger than I could have imagined," Rosemarie admits. "The opportunity worldwide never occurred to me. I figured it would be more of state-wide or regional interest, not international like it's turned out to be." Through working as a contractor and specialist in the area of accessible home design, Rosemarie has worked with scores of people looking to renovate or build their own accessible homes. "We have to look first at the entry of the home, and then we look at the kitchen and bath. That's the two rooms where we spend most of our time and where the circulation and layout are most critical for access and safety," she said. First and foremost: you need to fix the first barrier you encounter-your home's entrance! There should be a no-step entry with a low threshold at less than a half inch, "So you don't have to do a wheelie to get into the house," Rosemarie says. In her home, she chose a 1/20 slope to the entrance of the front door, which is quite gradual and reduces strain you may experience in your shoulders with steeper ramps. The door opening, too, should be analyzed. A 36" wide door opening should accommodate most wheelchairs. In all areas, you'll want a minimum of a 5-foot turn radius. In some cases, Rosemarie said, you may need a 6-foot radius for larger wheelchairs, but ultimately you'll want to be able to make a 360-degree turn. In order to use her sinks and countertops, Rosemarie had to think about the space her legs and chair would take up when she rolled up to it. Without space underneath, even a lowered countertop is unusable. Fifty percent of your storage should be accessible, so that means drawers and cabinets, says Rosemarie. "I purposely store things in the upper cabinets that I don't need unless someone else is there." For example, she says, I don't drink coffee, so I never need the coffee maker. But if I have a visitor, I'll have them reach the coffee maker. In this way, no space is left "wasted". One of Rosemarie's biggest items on the list is also one of the most important. A no lip, a curbless shower that allows someone in a wheelchair to roll right in and a channel drain are extremely important for the safety of the chair user. "Channel drains get water out quicker and makes showering safer," says Rosemarie. Plus, she said, accessible showers should be large enough to allow for a caretaker or professional aid if you need assistance. Similarly, a shower chair or bench is obviously needed for washing up. Rosemarie prefers the foldable option mounted on the wall so there are fewer complications with the setup. Grab bars with wall reinforcement not only need to be installed in key locations, but the height needs to be tested before installation. An improperly installed grab bar is just as dangerous as no grab bar at all. Especially important for both the kitchen and the bathroom areas are convenient countertop heights. Rosemarie's husband is 6'4" tall and uses a 40-inch high countertop for preparing food, but for Rosemarie, she prefers her 30-inch countertop for meal prep, while a 34-inch cooktop and sink works well for both of them. "I like that configuration better," says Rosemarie of her refrigerator and freezer. "If you are going to replace a refrigerator, this is the one I would own. I can reach anything in that refrigerator and freezer!" For some amputees, a side-by-side may still render some shelves out of reach, but at least half of both a refrigerator and freezer are accessible. We asked Rosemarie about budgets. Often people who need to modify a home don't have a lot of disposable income. She told us about working with Habitat for Humanity International. "That is the budget conscious, 1200-sq-foot, very affordable home," said Rosemarie. "When analyzing whether the volunteers who build these homes could make a no-step entryway, install multiple height countertops, or expand doorways, the answer became clear: it was all possible, and still affordable to even low-income families. [...] The design is what is important."